I think we can all agree that Rice Krispie treats are the perfect go-to recipe when you need a dessert, but you’re short on time and ingredients. Not only are they convenient, but they’re DELICIOUS, and my kids especially love them! 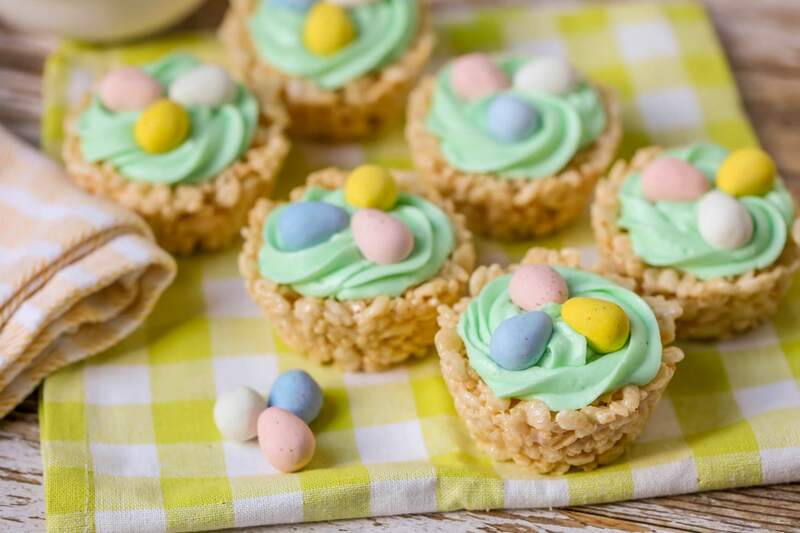 For that reason, I decided to make a festive Easter treat – Rice Krispie Easter Nests! 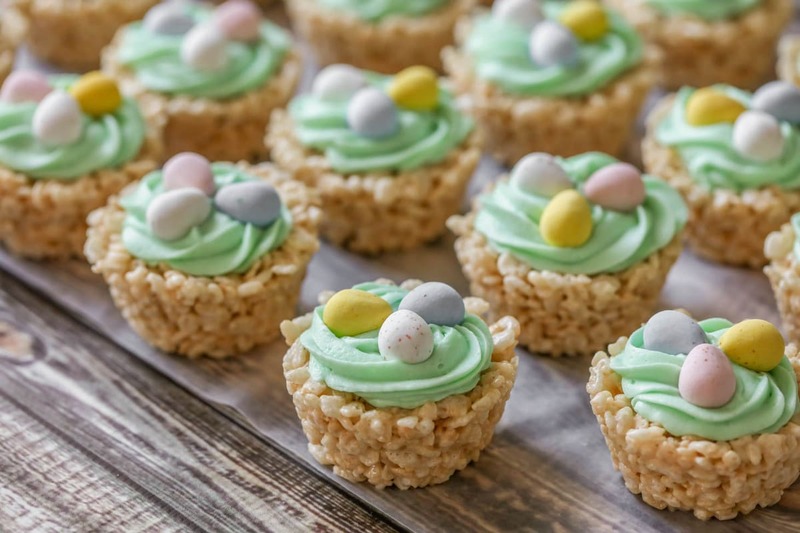 They’re kind of like the Easter Basket Cookie Cups we’ve made before, but instead of a cookie base, it’s Rice Krispies on the bottom. 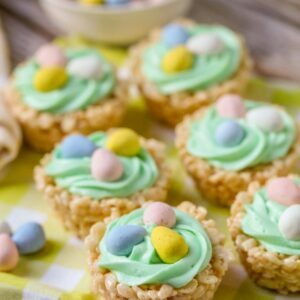 Although we loved the cookie version, I almost prefer Rice Krispies because they’re so much easier to make (and I thought they were tastier too)! 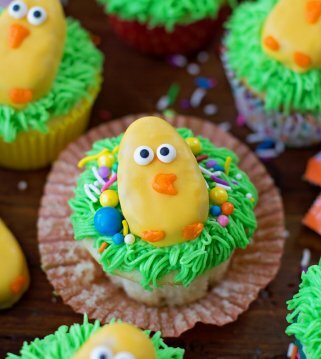 If you are looking for a fun and simple Easter treat, try this recipe. I know you’ll love it!! Making the actual Rice Krispie part is super quick and easy. Just microwave the butter and marshmallows, mix in the cereal, press into a greased muffin tin, and let it sit for 30 minutes or so. Then you pop them out and decorate! I love getting the kids involved with decorating the easter rice crispy treats. They have so much fun helping in the kitchen! I usually pipe the frosting, but I let them count out three candy eggs and put them on top. Frosting Tip: An easy piping method is to put a dollop in the center, and then pipe around it. I typically use a star dip, but it’s totally up to you! We used Cadbury eggs on top of our easter nests, but you could easily use robin eggs or Easter M&M’s instead! 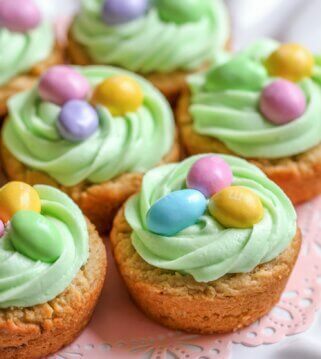 Add some shredded coconut (made green with some food coloring if you like) on top of the frosting before placing your eggs for added flavor and decor. Use Cocoa Krispies for chocolate Rice Krispie nests. Full size or mini cupcake tin? You can use either one depending on what size you want the final product to be! I usually use a mini cupcake tin, which makes about 30 bite sized nests. If you were to use a full size tin, it would make 12-15 larger Easter nests. How to store easter nests? These treats will stay fresh if kept in an airtight container, but only for about 2 days. Try and keep them in a container that will fit all of them just right, without much excess air. The more open space, the more likely they are to dry out. You can freeze unfrosted Rice Krispies by keeping them in an airtight container, separated by sheets of wax paper between each stacked layer. These should stay good for 6 weeks. When you’re ready to use, simply take them out and let them thaw before decorating. 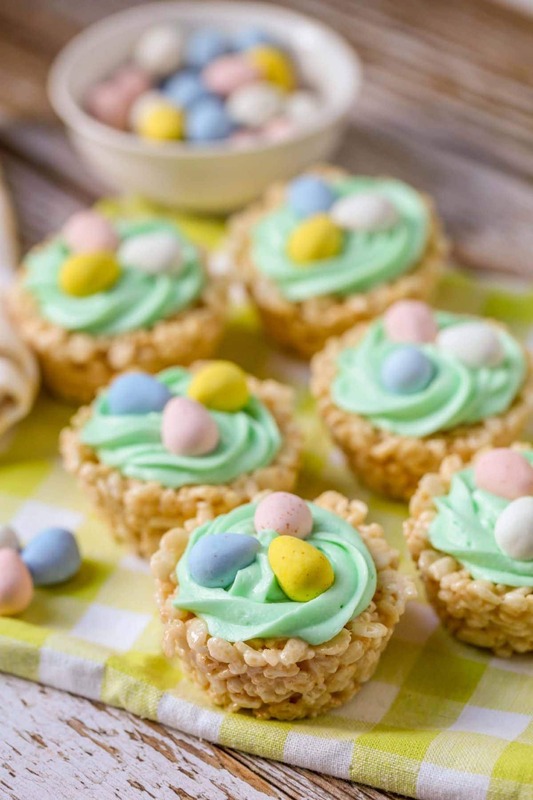 This really is a simple, festive and yummy treat to make for Easter. Add it to the menu, and you won’t be disappointed. It’s a crowd favorite. Grease cupcake pans and set aside. Stir together until well blended and pour in Rice Krispies. Stir until well combined. Spoon into greased cupcake pan and press down with wax paper. Let set for a half hour. Combine butter, milk, vanilla and 2 cups of your powdered sugar in a large bowl. Mix till smooth and creamy, about 5 minutes. Then add the remaining powdered sugar and food coloring of your choice. 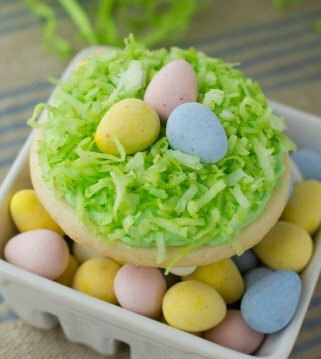 Pipe your frosting into your cookie cups and top with Easter egg candies. ENJOY! 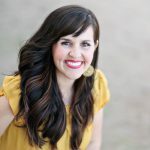 The kids will love them – so easy and yummy! These are so adorable for an Easter buffet table. These are adorable! 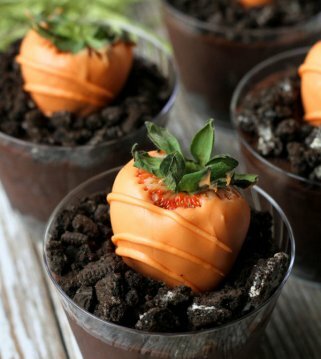 I love the little chocolate eggs on top too, those are my guilty pleasure around Easter time! 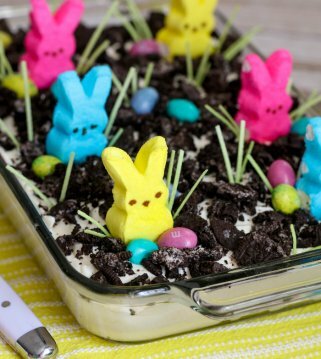 This will be going in my Easter Recipes to make!!! These are adorable. I’m sure they’d be a hit on any Easter table! These are adorable, perfect for Easter buffet tables! Did you grease pan first before putting in the rice crispys? Hi! 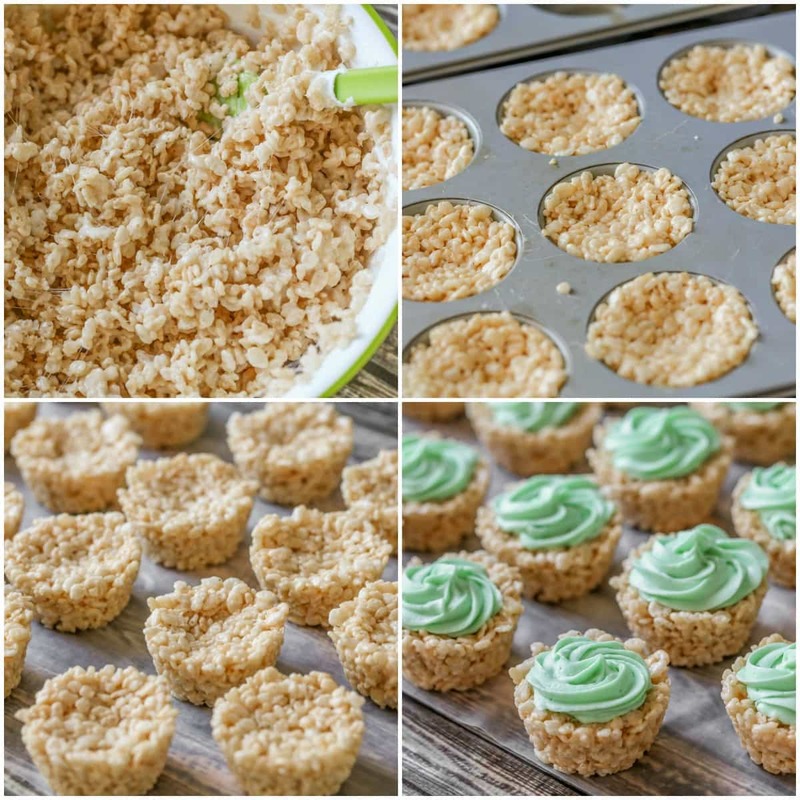 Did you use mini cupcake pans or regular size? I would like to know the answer also…..mini or regular cupcake pan? What size muffin pan did you use and how many did it make? how do you store so they are still soft to eat? Also, would these be two big to use a regular size muffin pan? Hi, what type of milk did you use for the butter cream frosting? I used fat free milk and it didn’t work at all. I just use what’s in my fridge..2% usually or 1%. Sorry, it didn’t work:( Hope you’ll try these again next time! Super cute! I bet my daughter would love to help with these. Mine do! Thanks so much and have fun making them! TB means tablespoon 🙂 Hope you like these! Mmm! These will be perfect with Easter coming up! They sure will!! Thank so much Emmy!! Have a great Easter! This looks perfect, just love it! They are 🙂 Thanks so much!! Hope you’ll give them a try. Looks good and easy to make yum. They are 🙂 Hope you’ll give them a try! Thank you! Can I sub salted butter for the unsalted butter for the frosting?? You can. I haven’t used it, but of course you can. Let me know how they turn out 🙂 Thanks! 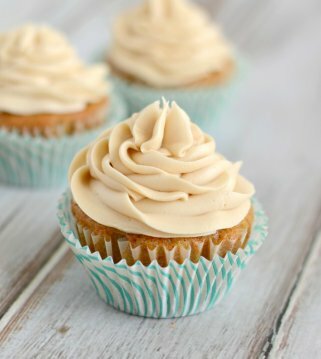 Salted butter is AWESOME in buttercream frosting….it’s what I always use! I love the recipes, can’t wait to try the cupcakes out. It will be fun to do with my granddaughter! Yes, cooking with the kids is always an adventure & fun! Thank you! They really are!! I am glad you found them! Thank you! In an air tight container would work 🙂 Enjoy! Thank you so much!! I hope they were a hit with the kids! What a simple and delicious treat to give to your friends. We made these last year and will be making them again this year to hand out!